Hey -- where's his tail?! This is a very early painted piece from 1984 by Kevin Eastman, depicting the Turtles' sensei, Master Splinter. It is probably a design study done before the printing of the first issue. -->> ..are you able to detect what paint and technique was used on him here ?? I actually kind of like that. It makes sense considering that Splinter would have found everything in super damaged condition in the sewer pipe...most likely..
Heh, planning a series is more difficult than I thought. How did you ever tune out all the ever changing ideas and concentrate on writing issue one? :) That's where I'm at right now :). I always wondered. 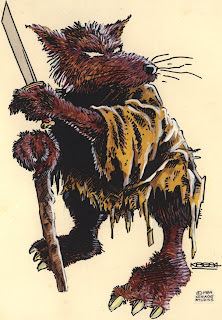 Who was it that came up with the character of Splinter, you, or Kevin Eastman? I really love how Splinter just looked totally badass in the old comics. Thats a cool drawing. I agree-- I'm glad he wasn't so ragged. And where WAS his tail? Still-- beautiful piccie. I like how you both drew him.